Thread: Sorry for removing my post, ive just got all the help I needed, thanks. I've got all the Help I needed, thanks a lot for taking the time to comment. Last edited by ROOSTERCAT; February 16th, 2012 at 06:11 PM. Reason: Not longer need the thread. About 1000 hours of hard work. . .
Iv'e sent him TWO models for one PRICE, the original sculpture and a resin copy. I actually made for him 2 one of a kind dinosaurs the parasaurolophus and the gallimimus for 500 usd. You're not REALLY charging $500 for a 1000 hours of work are you!?! How much did you charge this dude per dinosaur? What did your contract say? If he was using you as a work for hire contract artist he technically is right about the models now being "his", in that he can do with them what he will. It's even debatable if the film you linked suggests he did the sculpts. A demo reel might show another person's sculpt if they did the texture map and/or rigging for animation (although if used to get a job the art lead would want to know exactly which parts he did, and taking credit for something you you can't do is a good way to never work in the field again I'd think). While it would be awesome to get the credit, I'd say move on. If you did the actual sculpts, show off your talent and use that to get better jobs. I don't always get ripped off, but when I do, I charge 50 cents an hour. No one will be able to give you any advice here because your message is garbled and unclear. You'll have to explain in some detail who you are, what exactly it is you do, what your relationship is with Mr Romeo, what contract, if any, exists between you etc. You should probably consider becoming "THE LORD OF PUSHING A SHOPPING CART AROUND AND PICKING UP ALUMINUM CANS." Probably be more lucrative. . .
Did your contract not contain a paragraph about usage rights? Specifying clearly what the client is allowed to use the work for, and for which time period? ...You do have a written agreement, right? Last edited by Maidith; February 15th, 2012 at 07:06 AM. If you did sign a contract giving away the intellectual rights for your sculpts, then He can do as He pleases with them, as you worked as an artist for hire and had an agreement! So look closely at what was agreed, written and signed. Here is the basic premise of the United States’ copyright law: the creator of any copyrightable work owns all rights in and to that work unless, if there is to be an exclusive transfer of some or all of those rights, there is a sufficient, written agreement, signed by the creator, transferring some or all of those rights to another. And the publisher wants exclusive rights since non-exclusive rights may be not worth very much. Non-exclusive rights may be transferred orally but there still must be some form and evidence of intent to actually transfer any rights. Without an agreement to transfer, the publisher owns no rights because there has not been a transfer. That agreement can be oral or written but if the publisher is to acquire exclusive rights, it must be written and signed by the creator. Have a look around the internet for copyright and work for hire agreement laws. It’s worth noting that if He is getting work off of the back of your sculptures and is claiming to be the originator, then that’s going to come back and haunt him for a very long time. It’s a very close industry and people talk! On a positive note your work is exceptional, and even though you have lost out financially I would say that you have made some awesome pieces from what I can see so far. Get these images and creative processes into your Portfolio, send it to art directors and FX departments around the world, you may end up winning out in the long run. Last edited by AvP; February 15th, 2012 at 12:24 PM. I don't understand his demo reel, not my end of the business. Is he just rehashing Jurassic park stuff? He was like eleven when it came out. Is this just what people do in the industry? Dude This is what I wanted to hear, thanks!! you are the best. thanks also for the kind words. Why are you copying copyrighted material? Those dinosaur designs are Crash McCreery's from Jurrassic park. Unless you were paid by the copyright holders to make these you have no business doing it and passing it off as your own; and in my case no sympathy. A T-Rex is a T-Rex. Unless someone else can explain it. Because the trex in the movie has a distinctly mean and creepy look given to him by the designers. Look at a bunch of artists renderings and they are all different which is why this stands out as a copy. Also The dinos he named were all in the movies, what a strange co-inky-dink that out of the hundreds of dinosaours he chooses the JP ones and their color schemes. True enough. But I guess you'd have to look at where you would draw on for reference. I'd have to see his other models before I'd say anything. I can see where your coming from though. I agree they are scary, but look at these renditions all of them are different takes on trex bones. The last one is JP. Note they give him dark eye shadow and a pointy brow ridge to make him meaner looking? While the others have the same info they are trying to be true to the bones. dpaint is right, he used the Jurassic Park models, he said so in the beginning of the demo reel. Hi, here is my new demo reel, I will probably make several of them this year, this is the first one. Some models were made from a scanable maquette made by Galileo Hernandez, it was very usefull to get the basic shape of the model ( around 3000 faces, almost every finished model is between 8 000 000 to 12 000 000 faces). So thanks to him for the help on some models. He bought them to animate them. This thread makes my puzzler hurt. Anybody who knows anything about dinosaurs can spot the JP T. rex instantly. 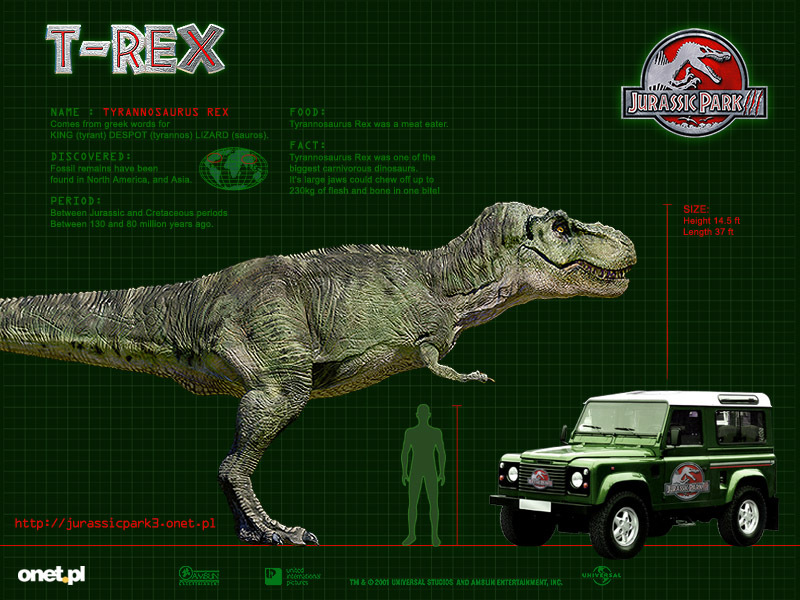 ha i just thought the jp rex was a realistic recreation, it never occured to me it need tuning to make it meaner, and that that tuning would leave a recogniseable signature, but its obvious in retrospect. I have a situation, whats the best way to act??? THERE WAS NO CONTRACT He just purchased the Models as any other costumer. I'm really having a hard time parsing this thread. Especially in light of the above statements you have made. You say he used them without permission, but at the same time you imply you did these for the guy knowing what he was going to use them for. Even asking for credit. Add in the fact that you don't have a contract and that you may have used the designs from Jurassic Park as models for your own sculpts and I just don't think you have any footing to lodge a complaint. As I'm not a lawyer, in answer to your first question, go talk to a lawyer and don't go to the internet for advice, as you are deep in the brier patch on this one. Seriously, no one should ever commit this level of effort on a project of this scope requiring this amount of hours and your obvious talent WITHOUT a contract. I simply don't understand why anyone would do that and then think that they can back pedal and start complaining about it after the fact. Consider what's happened a serious life lesson and LEARN from it. Wow, one of those post remover guys. Never really thought about the stylizing prehistoric creatures. Just always been used to a T Rex being mean and scary distinctly, never about variations of it. This is a T rex this is what it looks like lol. Making me interested in the creation process of envisioning JP. I don't blame him. He must be embarrassed and You guys are throwing allot of salt at his wound. He's probably digging a cozy little hole to bury his head in. LOL, good one, yeah lot of salt! Thanks for good comments, for the bad ones and for the ??? ones too. This did come from the lounge after all.